I got back yesterday midnight from two amazing weeks at the Oberlin Summer Workshop. It has been an absolute blast and a huge motivation for the future with a lot of new input. And it was a whole lot of fun! 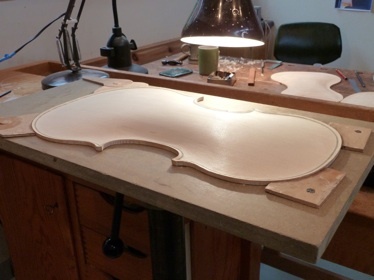 Also I have met a lot of very nice people and amazing violin makers who shared there thoughts and knowledge generously. I have been working on a late Del Gesu model and made most of the front and back for it at the workshop. Also, I finally varnished my test violin which I brought over in the white (treated with UV). It has been a great experience. I will add a picture. 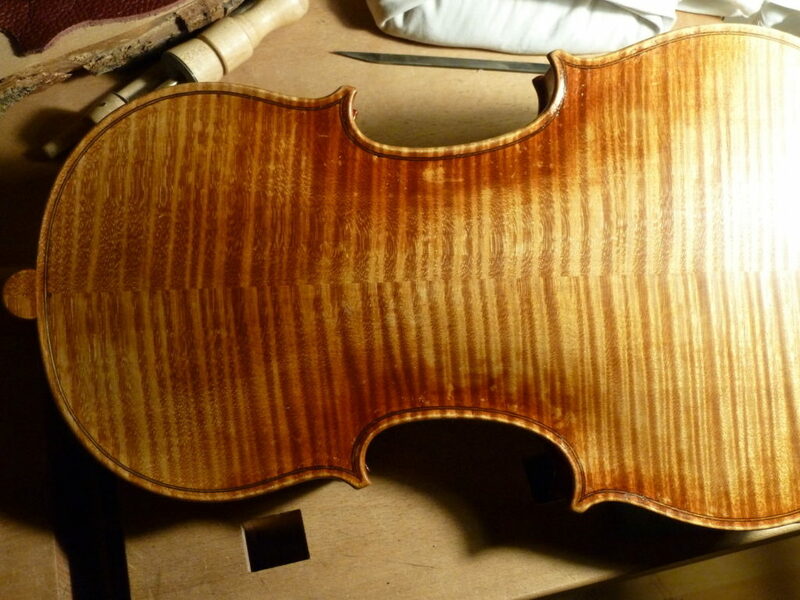 The main topic this year was the varnishing of a Strad copy by Antoine Nedelec and Jeff Philips. They showed us the whole antiquing which I thought was incredibly generous. The work they have been doing is absolutely stunning. I just wanted to thank you all again for this great opportunity! I hope to keep attending workshops like this and wish at some point I can be of some help to the next generation myself. For now I already know I will try to attend next years Oberlin workshop! In my second year at Newark I was awarded a financial grant for cello wood as well as a work experience placement. I am so grateful that I was able to afford a good quality set of cello wood. Together with some fellow students, I traveled to Germany to choose the wood myself from Gleissner Tonewoods. 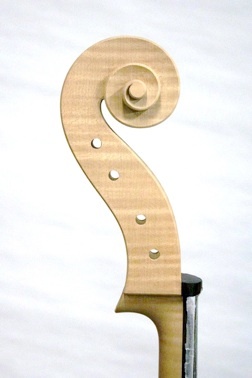 It was really nice choosing the wood from the source and I really enjoyed making my cello. 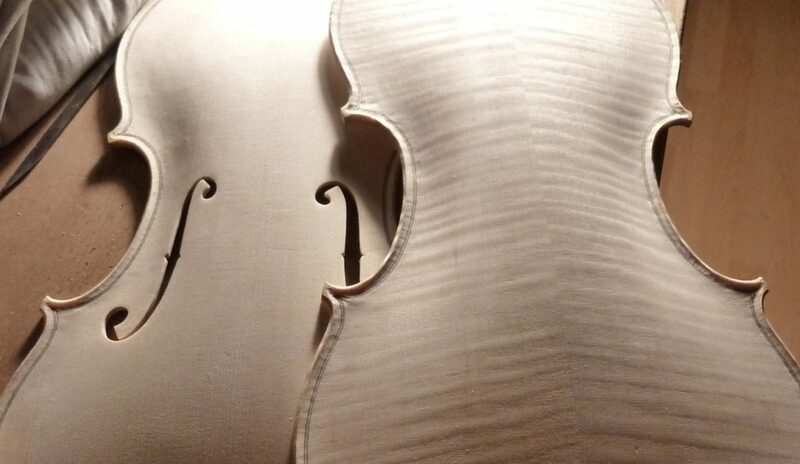 It was made after the 1710 Stradivari. The cello is currently in the varnishing process and I am so excited to finish it this year. 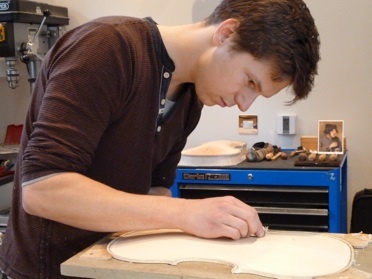 Having shown my interest in viola making, design and sound I was awarded a work experience with Helen Michetschläger. Together we looked at a viola model that would suit our ideas about function as well as aesthetics. 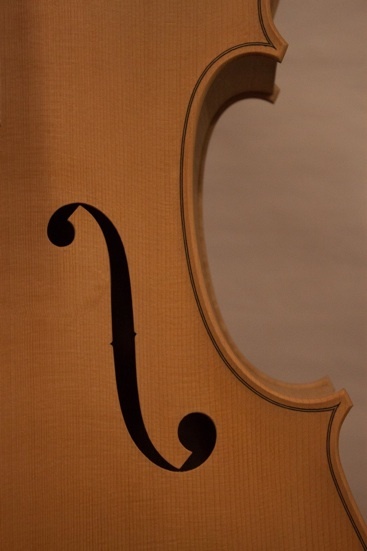 We came up with an outline inspired by a brothers Amati tenor viola. 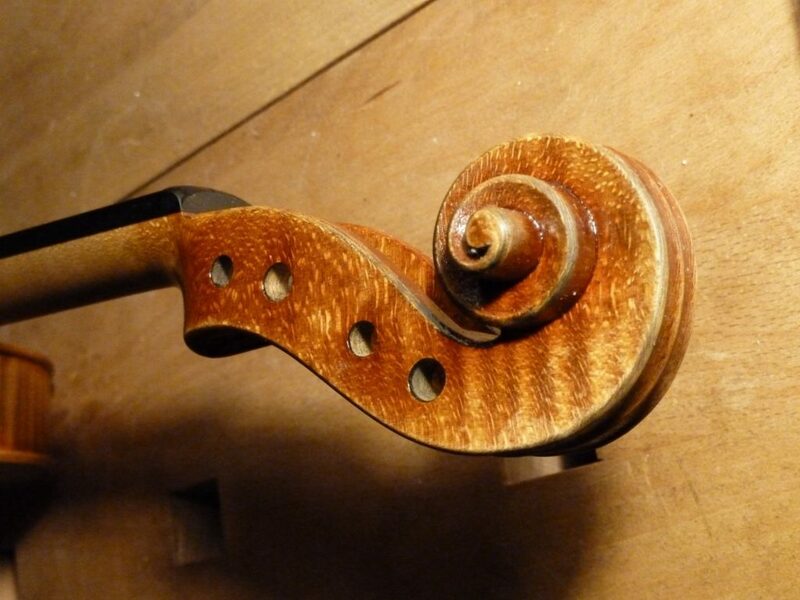 Changing body length, stop length and the size of the Cs but nearly keeping the full width across the centre resulted in a bold, wide but not too big instrument. We had two great working weeks, not only practically but there was also room for lots of discussions about all sorts of topics, ranging from viola arching, viola playability, cello neck pinning and peg hole positions to horizontal neck slant, tool use and wood finish. It made me think a lot more about my own making and how that relates to the player’s perspective. It is so important for students to see what we have to expect in the future and how we have to prepare ourselves. Having prepared the rib structure, rough arching, the outlines and most of the purfling, the first week was all about arching and thicknessing. It was good to see how to use more planes for both arching and thicknessing. In the second week I worked on my scroll, learned how to use the pillar drill for cutting out the peg box and I learned a new way to position the peg holes. There was as well time to pin my cello neck root, which was very exciting. Stabilising the neck root to try to avoid elevation problems makes lots of sense to me. All in all it was a great work experience and I would like to say a big thank you to the RAB Trust and Helen Michetschläger.